Theatregoer, she marries him. That hardly surprising revelation could save you around 200 minutes (that’s right, 3 hours and 20 minutes) of your valuable time, but please don’t let it do so, because this is a captivating and, at times, thrilling work. 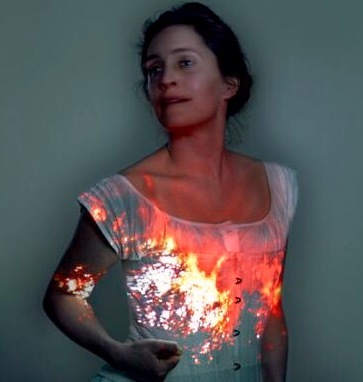 Co-produced by the National and Bristol Old Vic and directed by Sally Cookson, the production is a company-devised adaptation of Charlotte Brontë’s 1847 novel. Using words, movement and music, but minimal sets and props, to tell the story, it revives a form of theatre rarely seen since the landmark Royal Shakespeare Company version of Nicholas Nickleby at the Aldwych Theatre in 1980. Yet, while the vivid, exaggerated characters and semi-satirical style of Dickens adapted naturally for the stage, Brontë’s mix of mystery and romance is a different and perhaps more difficult proposition. It comes as quite a shock to enter one of the National’s two big theatres and find a set that is not lavish, but Michael Vale’s simple wooden structures of platforms, planks and steps gives the performers ample scope to move around the full expanse of the stage. A band of three musicians is seated on set throughout. Although this is not a musical, music is a key element, the eclectic selection including original compositions (by Benji Bower), traditional 19th Century airs, Noël Coward’s Mad About the Boy and Gnarls Barkley’s Crazy. Melanie Marshall provides glorious vocals and doubles as the mad woman upstairs. Apart from the two leads, four other actors share all roles, including a very lively dog. Felix Hayes is a bearded, rugged, brusque and enigmatic Rochester, much more the man described by Brontë than the handsome hero seen in most adaptations of the novel. Madeleine Worrall plays Jane from the moment she exits the womb through to her own motherhood, capturing beautifully the defiant spirit of a survivor, a resolute and principled girl and young woman. With so many varying elements being brought together, it is inevitable that not every scene works to perfection, but the production triumphs overall because of the imagination and invention that has gone into it and also because the creators succeed in harnessing the most vital element of all – the imagination of the audience.